The Kendon Dual-Rail Ride-Up SRL Folding Stand-Up™ Motorcycle Trailer is the flagship of the Kendon line. Designed to perform and built to last, this trailer is the perfect combination of form and function in one excellent, space-saving package.When in use, the Dual-Rail Ride-Up trailer provides ride-on loading capabilities, carrying capacity of up to two full-size motorcycles and Kendon’s renowned towing performance.When in storage, this trailer takes up about the same space as a standard bedroom dresser or chest of drawers. Thanks to our Suspension Reactive Loading (SRL) frame geometry and suspension design you can ride your bikes onto the trailer, making it much easier to load heavy, full-size bikes. As you ride your bike onto the trailer the suspension compresses under the weight of the bike, virtually eliminating the ramp-to-trailer apex. Once the bike is loaded, the suspension springs back up and levels the trailer. Our Ride-Up models feature wider loading ramps, wider rear sections, and foot extensions to provide safe foot placement when you ride the bike onto or back the bike off of the trailer. 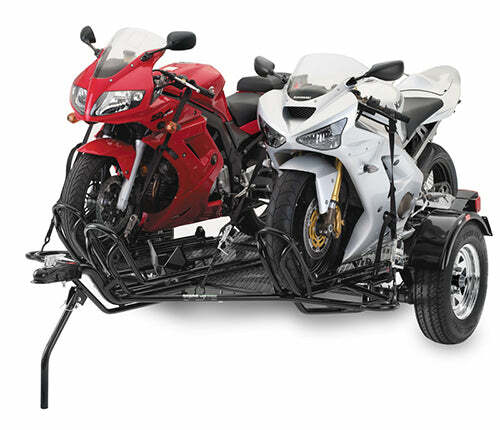 he Dual-Ride-up trailer features a wide expanded metal/diamond plate deck area designed to hold up to two full-size bikes such as Harley-Davidsons, GoldWings, K1600s, adventure bikes, etc. The heavy-duty torsion-bar axle and hub combination give the Dual-Rail its full 2,000-lbs. carrying capacity. When carrying only one bike, the independent torsion suspension allows for loading on either side of the trailer. 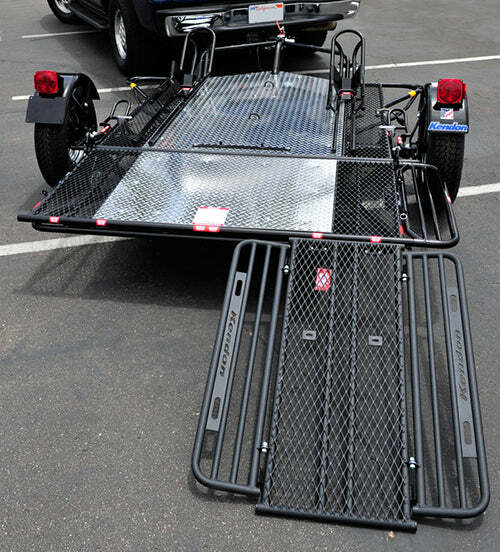 Optional center rail trailer accessories are available for towing a motorcycle in the center of the trailer. Add accessories to your trailer for a complete towing package. From tie-downs to spare tires to full Deluxe Trailer Accessory Packages. A range of accessory options is available to enhance the functionality of your Kendon trailer. Also available is a full line of replacement parts. Should something go wrong, Kendon has you covered. Dual Rail Trailer & Cargo Trailer for Cruiser style bikes, incl. Harley and Goldwing, Sport Bikes and other. The Dual-Rail Folding Stand-Up™ Trailer is the workhorse of the Kendon line. Tried and true, this trailer is built to last and has the outstanding features you’re looking for in a powersports trailer. Add in Kendon’s unique space-saving stand-up design, and you can’t miss with this cargo trailer. The Dual-Rail trailer carries up to two full-size motorcycles or, with the rails removed, can haul various types of cargo up to 2,000 lbs. When in storage, the Dual-Rail Trailer takes up about the same space as a standard bedroom dresser or chest of drawers. Our years of testing and refining our frame geometry helped us develop an amazingly lightweight, incredibly strong cargo trailer. That means a great ride for your bike and an easy tow for your vehicle. And for you that means a trailer that’s easy to stand up and maneuver in the garage. 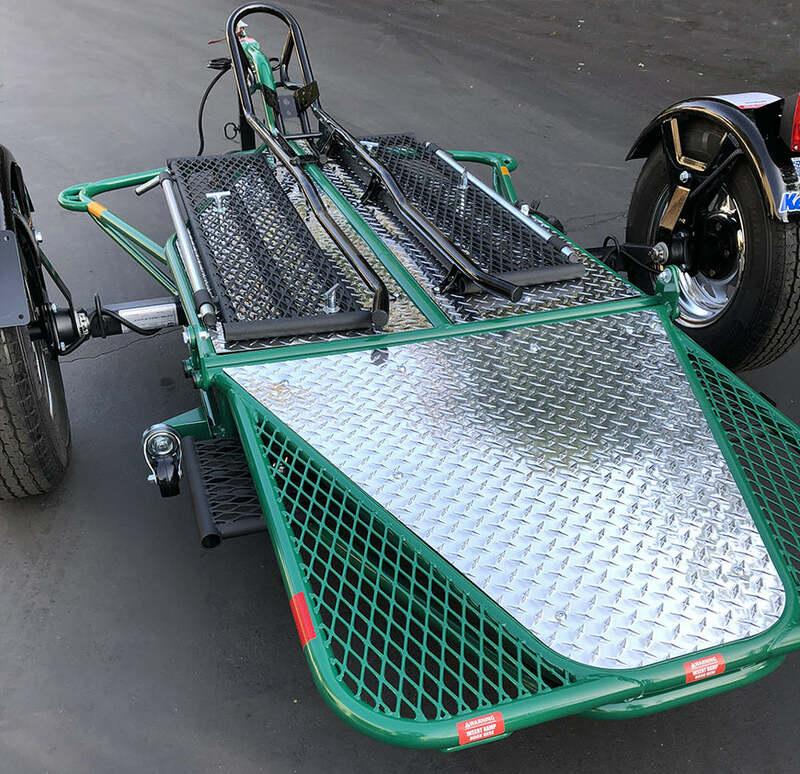 The Two-Bike trailer features a wide expanded metal deck area with diamond plate that is designed to hold up to two full-size bikes such as Harley-Davidsons, GoldWings, K1600s, adventure bikes, etc. With the rails removed the dual can be used as a general utility trailer for cargo. The heavy-duty torsion-bar axle and hub combination give the Dual-Rail its 2,000-lbs. load carrying capacity. The Dual-Rail Folding Stand-Up™ Motorcycle Trailer is perfect for any rider – from moto to track, cruiser to sport. It combines lightweight, user-friendly, space-saving design with full-size-bike trailering capabilities. Customize your trailer the way you want it at NO extra cost. ** Select from a range of color options and four aluminum wheel styles. Can’t decide on just one color? Choose two! You can select a one or two-tone color option to make your trailer stand out. Add accessories to your trailer for a complete towing package. From tie-downs to light upgrades to full Deluxe Trailer Accessory Packages. A range of accessory options is available to enhance the functionality of your Kendon trailer. Also available is a full line of replacement parts. Should something go wrong, Kendon has you covered. Go! Series Dual Rail Ride-Up Stand-Up™ Motorcycle Trailer for Cruisers, incl. Harley, Goldwings and Sport Bikes. Go! Series Dual motorcycle trailers combine the industry leading design and engineering qualities of our flagship Dual Ride-Up Motorcycle Trailers with more value-oriented materials and features to create the perfect combination of a fully functional cost-effective folding motorcycle trailer. The Go! 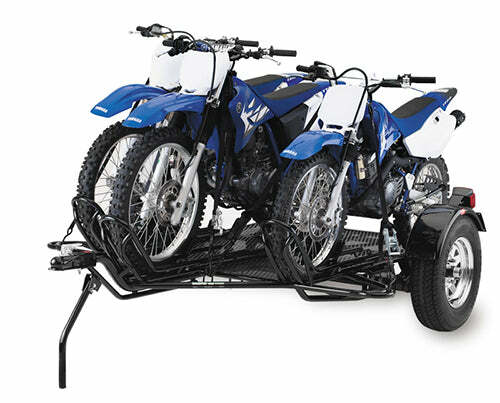 Series Dual-Rail trailer can carry up to two full-size motorcycles, and/or cargo, and is equipped with a third rail to carry three dirt bikes or one full-size bike in the middle plus Kendon’s renowned Stand-Up™ folding feature. When in storage, the Dual-Rail takes up about the same space as a standard bedroom dresser or chest of drawers. The Kendon Go! 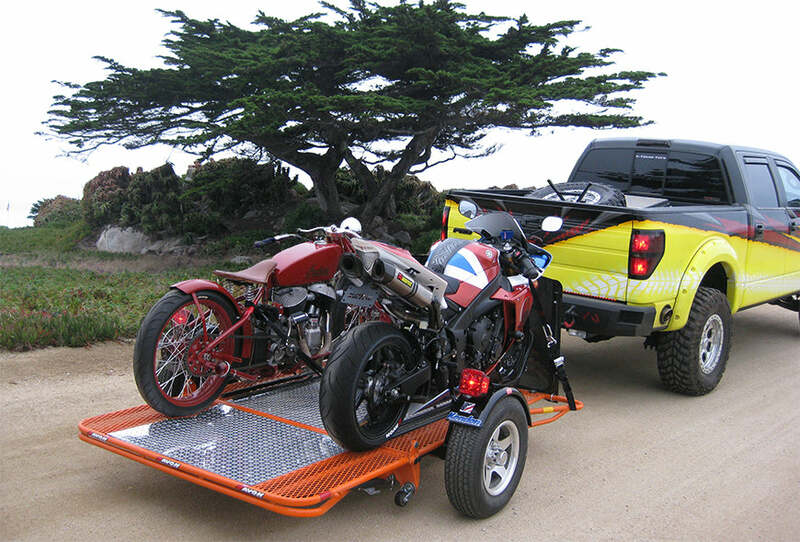 Dual-Rail trailer features a 5′ x 7′ expanded metal and diamond plate deck area designed to hold up to two full-size motorcycles such as Harley-Davidsons, GoldWings, K1600s, adventure bikes, etc. The heavy-duty independent torsion-bar axle and hub combination give the Dual-Rail Go! bike trailer its true 2,000-lbs. carrying capacity. The independent torsion axle allows for towing one bike on either side of the trailer while maintaining perfect balance. An Optional Center Rail accessory can be added if you’re looking to tow a single motorcycle in the center of the trailer. Not looking to tow a bike? No problem. This folding motorcycle trailer has removable rails so you can load practically anything that can be safely tied down on the flat deck area of the trailer. The Go! Series Dual Ride-Up Folding Motorcycle Trailer combines ride-on convenience and safety with a lightweight, user-friendly, space-saving design. Designed for bikes and cargo of all sizes and riders of all styles, this trailer can handle it all without breaking the bank. Just like our hand-crafted Dual Ride-Up SRL Trailer, the Go! Series two bike trailer features durable light-weight frame geometry and suspension design that allows you to ride your bike onto the trailer. The ride-on operation makes it much easier to load heavy, full-size bikes. The included frame extensions allow you to put your feet down to safely throughout the loading and unloading of your motorcycle. When the bike is loaded, the Kendon classic rail and wheel chock system keeps your bike upright so you can strap down the bike for safe and easy towing. Our Ride-Up models feature wider loading ramps, wider rear sections, and foot extensions to provide safe foot placement as you ride the bike onto or back the bike off of the trailer. The folding ramp on the dual motorcycle trailer can be stored on the trailer while towing and while folded for storage.